Joan Covert had been working as a dialysis technician when her friend told her she might be a good fit for a newly vacant vascular access coordinator position at their clinic. Since taking the position five years ago, she has seen it evolve as patient needs and technology change. We sat down with Joan to learn why she loves being a vascular access coordinator and what you should consider if you want to be one. Was there anything that surprised you when you took on the vascular access coordinator role? A lot of people don’t realize you have to be really organized and you have to almost be OCD-ish with chasing people down and all that. It's involved in a lot. The job actually has evolved even more since I've been doing it. And I wasn't even really sure what my friend did in this position because we never talked about it. For example, I did not know that she carried a cell phone with her. That was work related. So I have a work cell for doctors, patients, and staff to contact me. I wasn't aware of that. I just didn't understand a whole lot of it and how much was involved in it. Like all the appointments, all of the tracking, all the auditing. I just really did not know how involved it was. I’ve been doing this for five years and I love my job. How are you using Transonic’s HD03 monitor in your job? I test approximately 180 patients a month. I look for trends and changes. For example, if there's a trend downward then I set them up with our interventionalists. Or sometimes the surgeon prefers to see those patients. Then I'll make a surgeon appointment for them. After I test them, I put their results in the lab section of our software electronic medical record so it comes up with their monthly labs. The results are also in a system so the doctors can see it and they print up or look at their lab values. So they'll see it as well. I don't have to run to them and say, "Hey, this one's low, I'm gonna set them up." It's right there, they know it. So we just follow criteria to set them up. The vascular access coordinator position is fairly new. What advice do you have for someone who might want to become one? You need to be extremely flexible. In my job, we have 31 stations and we have four shifts, Monday to Saturday. So, there's 31 patients at a time. We also do acutes here. So if they have a catheter they're acute. I just kind of keep them on the back burner until I know that I have to start sending them to the surgeon once they're chronic. The doctor will tell me to set them up so then I just start the process. So you have to be really flexible. You also have to be really organized. I can't say enough about that for tracking and to know what's going on with the patients and their access. It’s juggling all the time because you're testing the accesses and then you're watching the new patients coming in getting accesses placed. Then you're monitoring those appointments and waiting for them to get to be able to use their access, and you need to make sure you get the fistula team going. You have to be prepared to be able to juggle many tasks at once and be flexible. We print out a census of our patients by shift and day. I highlight with a certain color the catheters. I highlight if they have one of each, a different color. 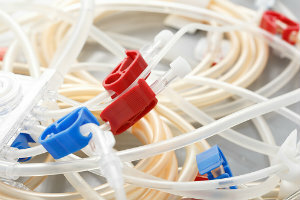 An access and a catheter. Then, I have everybody listed as to what access they have. But I pretty much know what they have without looking. Then I use that for tracking. I have a form that I started for our docs to alert them of all the catheters that are greater than 90 days whether they have an access or not. They all get a hard copy once a month put in their mailbox of the catheters that are hitting 90 days. Then a little paragraph of what's going on and why they haven’t moved on. How do the patients benefit from a vascular access coordinator? When patients first come to us and they don't have an access, I always go out and do the education for them. I show them what a catheter is. I have a catheter that they can touch. I build rapport with them right away. I give them as much education as I can regarding their catheter so they can prevent a possible infection and I give them information on what an access is. The types of accesses. I have a business card with my cell phone on it that they can email me, call me or text me if they're worried or have a question or their family does. They can reach out to me if they're scared. I have all kinds of stuff to try to help them understand what's going on, or I've even offered to sit at a doctor's office with somebody if they didn't have anybody to sit there. Patients know I'm there to help them. Right away that's what I tell them, I'm here to help you and guide you through it. First, when I come in I check our hospital census. When I walk in I look to see if any of our patients are in there. I do the audits. I check the notes on the patients to see that they're documented properly. I check all of my people I'm waiting to get the OK from the surgeon to start using their access. So I check to see if somebody left me notes on that either in the patient's chart or by email. I have my phone with me all the time so if they sent me the email, I know it. I do the CDC tracking audits. I also help set up the surgeries just by calling the surgeon’s office and then making sure we do the EKG here in the lab work, if needed. When the interventions come through, I document that they had an intervention and then what the outcome of that was. Just dictating what the doctor put in there. Then we have an access section in the chart online so then that goes in there as well. That's tracked in there as well.